Contributors: Cherrel Africa, Mcebisi Ndletyana, Kealeboga J Maphunye, Vanessa Barolsky, Ebrahim Fakir, Zandile Bhengu, Josefine K Larsen, Bavusile B Maaba, Thabisi Hoeane, J M Kivilu, R Mmotlane. Key terms: 2009, elections, Party, support, voter behaviour, Western Cape, Trends, patterns, 1994, Congress of the People, Evaluating, election management, South Africa, youth, participation, African National Congress, KwaZulu-Natal, resurgent, Zulu, ethno-nationalism, Racial, ethnic, Surveys, Scientific predictions. ABSTRACT: Since 1994 election outcomes in the Western Cape have been examined through analyses of the �coloured vote'. These explanations, which are premised on the racially based motivations of voters, feed into the choices, rhetoric and behaviour of political parties. Besides inadvertently providing justification for racially inflammatory campaign strategies they allow parties to neglect their duty to give voters adequate information. In this article I provide an overview of voting trends and the political developments which have underpinned these patterns. I argue that it is not the nature of the electorate but national political developments and political parties, through their behaviour and campaigns, that are responsible for gains and losses and for the dramatic political changes in the province. I further argue that it is precisely because racial identity is so salient in the Western Cape that parties need to move towards more inclusive campaign strategies. ABSTRACT: This article examines the performance of the recently formed Congress of the People (Cope) in the 2009 elections. It traces the origins of the organisation, probes its electoral strategies and provides insight into the internal challenges Cope encountered. The paper contends that Cope sought not only to envelop itself with the symbolism of liberation politics but also to transcend that by appealing to other constituencies that had not historically supported the liberation movement. This meant adopting policies that were not only targeted at the middle class but were also trans-racial. Ultimately, though, Cope's appeal was undercut by, among other factors, the persistent salience of racial inequality and excessive reliance on political activity as a source of income rather than a pursuit of principles. The article further argues that incidents related to the party also shone a light on the indifference of the business sector to competitive electoral politics and on the way the ruling party has blurred the distinction between itself and public institutions. Dr Kealeboga J Maphunye is Manager: Research and Knowledge Management, Electoral Commission of South Africa; he writes in his personal capacity and the views expressed in this paper are the author's personal opinions and do not, in any way, represent those of the Electoral Commission of South Africa. ABSTRACT: This article examines election management and the role of South Africa's election management body (EMB) in the context of the country's 2009 elections. 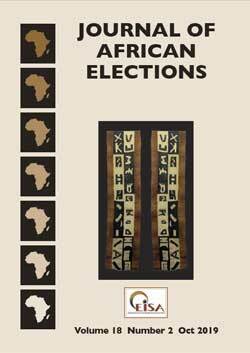 It outlines and analyses the dynamics and challenges faced by South Africa's Electoral Commission in managing the country's fourth democratic election, argues the case for election management and emphasises that election management can help in the promotion of electoral democracy. Specifically, the paper analyses the financial costs and other challenges experienced by the Electoral Commission during the 2009 elections, including those related to overseas voters, the use of technology to enhance election management, and the importance of EMBs in the planning and management of elections internationally. The paper concludes with an assessment of the relevance of election management in the promotion of electoral democracy and proposals on how effective election management may contribute to the success of meaningful and sustainable elections to enhance South Africa's democracy. Elections: Extinguishing antagonism in society? ABSTRACT: In April 2009 South Africa held its fourth national democratic elections. With a large voter turnout and little violence, the elections were hailed as an indication of the �maturity' of South Africa's democracy. However, in the days following the elections, violent community protests swept across the country and have remained ongoing to date. How is it possible to make sense of this apparent paradox between the peacefulness of South Africa's elections and the violence? In particular, why is so much of this violence apparently �irrational'? Why has the succession of �peaceful' elections in South Africa not extinguished it? These disparities are difficult to interpret in a dominant discursive paradigm which assumes that elections constitute the triumphal moment of democratic politics, capable of steering the country ineluctably towards a state of permanent peace. It is argued that the apparent �paradox' posed by �peaceful' elections and violent community protests is not an empirical problematic but a conceptual one and is born out of a conception of the political domain and elections within this domain in purely legalistic and technocratic terms. In this conception, therefore, elections are merely a managerial exercise, divorced from wider relations of power and conflict. The fundamentally conflictual nature of democratic politics is ignored in favour of an emphasis on �consensus' in the pursuit of �national unity', obfuscating the underlying power inequalities on which such consensus is frequently based. This article explores how South Africa's 2009 elections were interpreted in terms of this �managerial' discourse in order to attempt to relocate elections within a more deeply rooted understanding of democracy, which does not assume a teleological progression towards an ultimate state of peace, but which engages with the material reality of contestation and blood in post-apartheid South Africa. ABSTRACT: It was widely believed that more young people would participate in the 2009 general elections than had participated in elections in the past. This conjecture was based on increased youth registration figures at certain points in the registration process. Since 2007/2008 there had been an intense focus globally on the historic election of Barack Obama as the first African American president of the United States and it was surmised that his victory would invigorate an interest in politics around the world. The Obama election campaign's extensive use of new media technologies, as well as the crafting of his central campaign message to appeal to the twin ideas of hope and change were thought to have had an invigorating impact on political idealism, political activism and political participation. This, along with other factors, it is widely claimed, had an effect on political and electoral participation in South Africa, especially among the youth. This article investigates these claims and examines trends in the participation of the youth in the four general elections held in South Africa since 1994, with a specific focus on the 2009 elections. ABSTRACT: This paper probes the ANC's phenomenal performance in KwaZulu-Natal (KZN), where the party not only registered a rare outright majority but also experienced a stunning rise in support, while dropping support in the other provinces. Yet the ANC-dominated provincial government in KZN did not perform dramatically differently from other ANC provincial governments. The ANC's rise in KZN can be put down to a resurgent Zulu ethno-nationalism that swelled around the party's presidential candidate, Jacob Zuma. Zuma projected himself as a victim of ethnic persecution, a view assisted by the reputation of his rival in the ANC, former president Thabo Mbeki, as a scheming and cunning politician who dealt harshly with his rivals. Zuma's candidature essentially renewed the saliency of Zulu ethnonationalism in South African politics just as it was waning. Dr Thabisi Hoeane holds a PhD in Political Science and is a Senior Lecturer in the Department of Political Sciences, University of South Africa. ABSTRACT: The perennial debate among academics, the media, analysts and the public in general, especially during election periods, is the level and extent to which racial and ethnic factors can be said to explain voters' behaviour in making their choices. There are two competing viewpoints. The first asserts that these two variables are primary in explaining voting behaviour, the second that they are of limited value in understanding electoral outcomes. The debate is significant as it is linked to and has an impact on the country's democratisation trajectory. The former viewpoint is generally negative, the latter relatively positive. The pessimistic view considers the voting patterns as necessarily imperilling democracy while the optimistic view posits that their existence in and of themselves does not threaten democracy as they have little agency in determining voters' choices. This article argues that race and ethnicity have had only a superficial effect on electoral outcomes from 1994 to 2009 and hence should not be accorded primacy in explaining the outcomes. An analysis of the 2009 elections provides tangible and incremental empirical evidence that their import and value as explanatory variables is weakening. Surveys: Scientific predictions or navel gazing? ABSTRACT: Pre-election surveys to predict election outcomes have produced inconsistent results because different researchers or research organisations apply different methodologies and research designs even when dealing with the same subject. The object of this article is to interrogate the nature of survey research as a scientific tool in general and to trace the development of its use in political and government settings, especially in South Africa, to predict election results. The study strives to establish whether or not some pre-election surveys in South Africa rely on inadequate methodology, or else succumb to political pressure to produce predictions that favour a certain party? Attention is directed to issues of reliability and the validity of survey results that can predict the outcomes of elections with a high degree of accuracy. We examine the extent to which different survey organisations and researchers heed the prerequisites and demands of scientific methods in research and, more especially, the methodologies used in surveys. Examining results produced by various research organisations we explore whether political surveys today are adequate tools to predict scientifically outcomes in an election or whether they are simply mechanisms used to arrive at desired goals at the expense of scientific methods. Common flaws in methodologies used to make predictions are identified and discussed.